Alfalfa. Looking at fourth cutting? How desperately do you need the forage? Some recent research out of Quebec shows that alfalfa needs at least 500 growing degree days (GDDs base 40 degrees) after the last cutting OR less than 200 GDDs prior to a killing frost (25 degrees) for winter survival. Also, forage quality doesn't change as quickly in September, so waiting another week before harvesting will not have much impact on quality. Weigh the risks of taking the cut with the age of the stand in mind. To run some scenarios looking at GDDs, check out http://newa.cornell.edu/. Take a look at some historical data under Weather Data to help make your decisions. Looking at Rochester for the past two years showed 694 GDDs in 2014 and 837 in 2015. Accumulations drop off significantly in October, so weigh the risks with the needs. Don't forget the importance of good fertility, especially potassium, heading into winter. Adequate potassium is needed in early fall to store energy reserves for winter survival. Some regrowth will help to catch winter snow to hold it for protection and moisture. 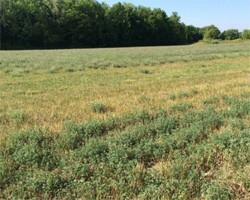 Fields will need early spring assessment of stand survival. If some timely rains arrive, an additional 50 lbs. actual nitrogen will help provide a yield boost for grass fields or pastures. Pastures. Don't jump the gun on getting back to grazing. Some farms are experiencing some regrowth and are patiently waiting, while others are not. Best to give them time to grow to 8-10 inches. Don't overgraze unless you are planning to open things up for a March frost seeding. Fall is the best time to plan for that with either short mowing or close grazing. Another option may be to stockpile for dormant grazing. Even then it is still critical not to overgraze. Hay supplies. The USDA's National Drought Mitigation Center states as of August 9th 17% of the hayland across the country is impacted by drought. According to Progressive Forage website under News, for the first week of August hay supplies generally exceeded demand. This was lower-quality hay with many areas reporting little dairy quality. Supplies are variable across the state. Locally, many hay sellers are taking care of repeat customers now and hanging on to the rest. Hay is out there, you'll need to find it and secure enough to get you through the winter feeding season. There are many sellers with listings on the internet. One site that has a listing state by state is http://www.hayexchange.com/. The listings appear to be current; descriptions (alfalfa, timothy, etc.) with prices listed. Another option is https://www.haycountry.com/. Prices on these two sites run $200-225/ton. There are also auctions in the region. Finger Lakes Produce Auction has sales every Friday at noon, Finger Lakes Livestock Exchange will hold hay and straw auctions on Wednesdays at 10 am starting in October. Food for Thought. Keeping the ground covered through the winter is critical, too. Cover crops or winter small grains capture nutrients to hold them for next year's growing season.